In the age of "complex Tv", of social networking and massive consumption of transmedia narratives, a myriad short-lived phenomena surround films and TV programs raising questions about the endurance of a fictional world and other mediatized discourse over a long arc of time. The life of media products can change direction depending on the variability of paratextual materials and activities such as online commentaries and forums, promos and trailers, disposable merchandise and gadgets, grassroots video production, archives, and gaming. 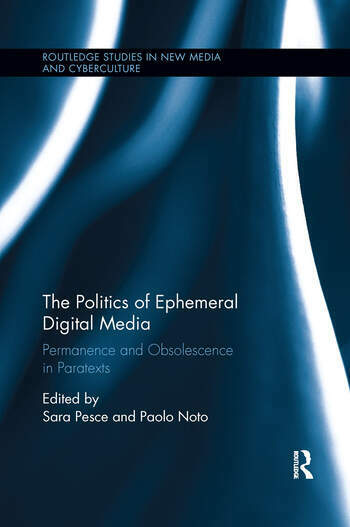 This book examines the tension between permanence and obsolescence in the production and experience of media byproducts analysing the affections and meanings they convey and uncovering the machineries of their persistence or disposal. Paratexts, which have long been considered only ancillary to a central text, interfere instead with textual politics by influencing the viewers’ fidelity (or infidelity) to a product and affecting a fictional world’s "life expectancy". Scholars in the fields of film studies, media studies, memory and cultural studies are here called to observe these byproducts' temporalities (their short form and/or long temporal extention, their nostalgic politics or future projections) and assess their increasing influence on our use of the past and present, on our temporal experience, and, consequently, on our social and political self-positioning through the media. Sara Pesce teaches film history and performance studies at the University of Bologna. She’s published on the historical roots of Hollywood, cultural memory, and performance. She wrote books on Hollywood Jewish founders (Dietro lo schermo, 2005), on WWII memory in Italian film (Memoria e Immaginario, 2008), on Laurence Olivier (Laurence Olivier nei film, 2012). Paolo Noto is Lecturer in film history at the University of Bologna. He is one of the editors in chief of L'avventura. Internation Journal of Italian Film and Media Landscapes and the secretary of the open access journal SERIES (series.unibo.it). He has authored two books, dedicated to the Italian neorealism (Il cinema neorealista, with Francesco Pitassio, 2010) and to the application of genre theory to the Italian post-war cinema (Dal bozzetto ai generi, 2011).